VIA is geared towards flexible lifestyles, featuring tailored amenity spaces including Hush work pods, Linked tech bar, Vibe lounge, Flix living room, and Taste private dining room. Fitness amenities equipped with high-tech virtual programming are located on site, including Synergy fitness center and Centered yoga + wellness studio. 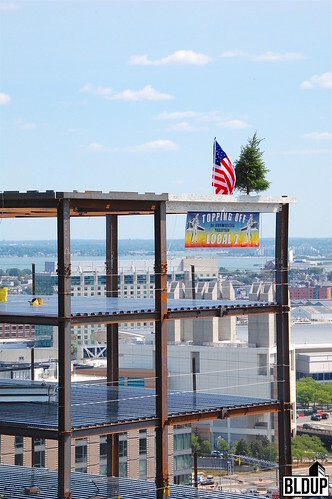 VIA's 9,000-square-foot AIR Terrace features sweeping views of Fort Point Channel, the Boston Harbor and Downtown Boston, and is graced with modern stylish furniture, lush greenery, a fire table with fireside seating, grilling stations, and a custom-designed granite water feature. Three distinct finish schemes are available in VIA residences for residents to choose from, ranging from warm cream tones to clean white finishes. VIA apartments feature open concept living spaces, oversized spa bathrooms, and quartz countertops. The building’s Fusion wing, a chic, minimalist innovation-focused housing component, features 96 studio and one-bedroom apartments with additional amenities including two work lounges and a 9th floor terrace with stunning water views. 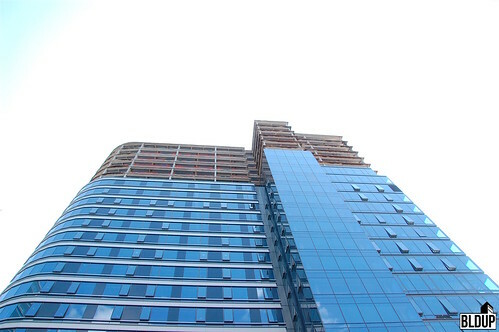 An additional 96 apartments at The Benjamin & VIA are designated affordable. 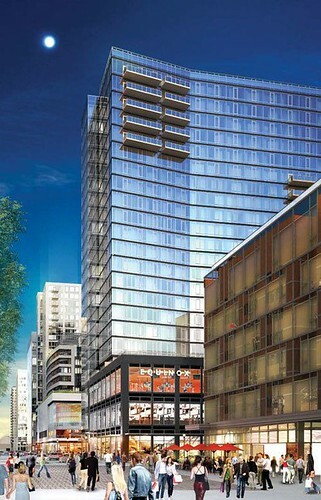 250,000 square feet of exclusive retail are located at The Benjamin & VIA across both buildings’ first three stories. Now open at The Benjamin are fitness and lifestyle leader Equinox, destination nightclub The Grand, Mexican tequila cantina rock bar Scorpion Bar & Restaurant, men's clothing store Bonobos and Seaport Barbers. At VIA will be bowling experience center Kings Bowl, 320-seat artisan Italian restaurant and marketplace Tuscan Italian Kitchen & Market, a 10-auditorium, 860-seat movie theater Showplace ICON Theatre on whose ground floor will be chic restaurant and full bar Lobby Lounge, and high-energy steakhouse STK®. 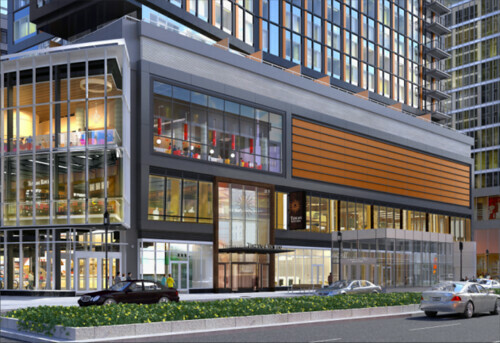 Newly confirmed retailers at The Benjamin & VIA include Italian coffee house Caffe Nero, outdoor outfitter Filson, clothing and outdoor gear store L.L. Bean, athletic apparel retailer Lululemon, men's clothing retailer Mr. Sid, and eyeglass retailer Warby Parker. 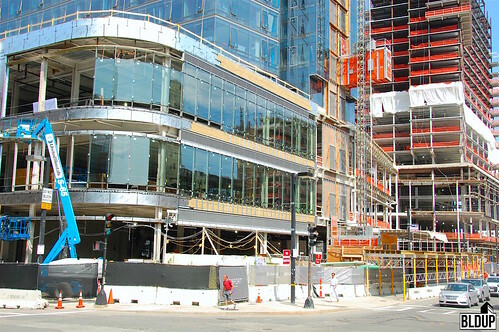 Between retail spaces at The Benjamin & VIA is Courthouse Square, a 17,000-square-foot open space serving as a key pedestrian link between Seaport Boulevard and Northern Avenue. 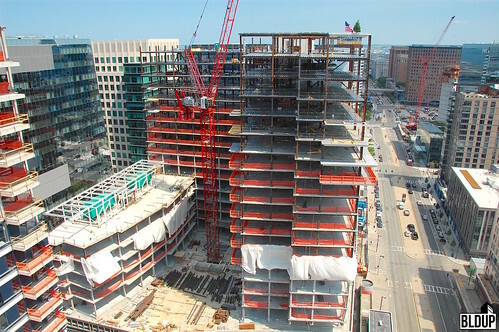 A 775-space below-grade parking garage is offered at The Benjamin & VIA across three levels, including 430 parking spaces for residents and 345 public parking spaces. 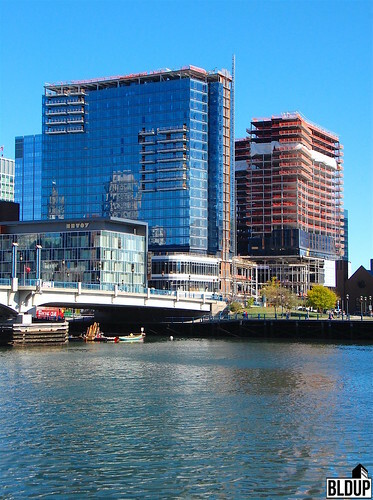 The Benjamin & Via in Boston's Seaport District has been refinanced for $468 million via American General Life Insurance Company. March 27, 2018 – Boston, MA – New England outdoor retailer L.L.Bean, best known for its L.L.Bean Boots and world-class customer service, announced the grand opening of its very first urban retail store at One Seaport in Boston on April 6 at 9 a.m. 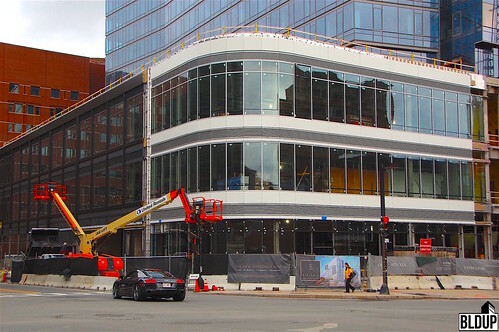 The 8,600-square-foot store will feature an assortment of active and casual apparel, outerwear and footwear, as well as a variety of outdoor gear curated specifically for residents and visitors of Boston. The grand opening celebration will begin on Friday, April 6 and go through Sunday, April 8. Everyone is invited to the three-day event featuring giveaways, games, a weekend block party, L.L.Bean’s famous Bootmobile and more. The Grand and Scorpion Bar, two exciting new nightclubs spearheaded by local nightlife venue proponent Big Night Entertainment Group, have opened on the ground floor of The Benjamin new-construction apartments in the Seaport District, the latest development in the Seaport’s transformation into Boston’s hottest nightlife destination. The Grand opened Wednesday night with a sold-out show headlined by EDM artist Hardwell, and will host two more opening shows Friday and Sunday nights featuring R3HAB and Steve Aoki, respectively. Scorpion Bar will host its’ opening party tonight, featuring former Kiss 108 radio personality DJ Costa. The Grand meshes glamour, sophistication and high energy, featuring an expansive dance floor, an open glass staircase, custom marble tables, hand-blown glass chandeliers and a 70-foot LED wall. The club will provide a full VIP experience, with stadium VIP bottle seating and VIP bars. The Grand will operate Friday, Saturday and Sunday nights from 10 PM to 2 AM, and will be available for events all week long. Scorpion Bar will be a unique blend of a traditional Mexican tequila cantina and a rock bar, with a Mexican-inspired food and cocktail menu including over 100 tequilas and scorpion dancing. The venue will be open daily from 12 PM to 10 PM, with the bar open Sunday to Wednesday from 12 PM to 12 AM and Thursday to Saturday from 12 PM to 2 AM. 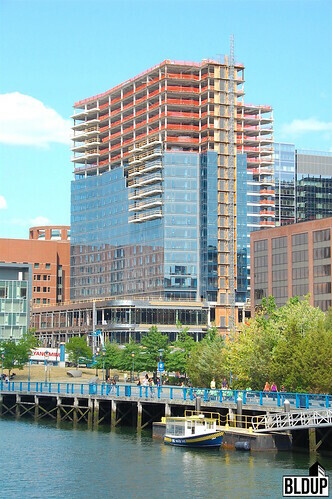 Locally-based ground improvement expert Treviicos played an instrumental part in the recent completion of The Benjamin & VIA, two exclusive mixed-use towers in Boston's Seaport District featuring 832 modern apartment residences and 250,000 square feet of retail, constructing the building’s below-grade slurry wall foundation. Treviicos constructed a 1,552-foot-long, 86,500-square-foot reinforced concrete slurry wall along The Benjamin & VIA’s perimeter, which serves as the development’s foundation wall. 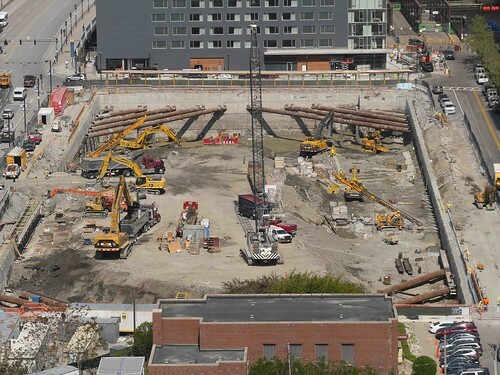 The Benjamin & VIA’s location just steps from Boston Harbor presented significant geotechnical challenges, including persistent groundwater presence and unstable soil conditions, that Treviicos was able to expertly navigate, constructing a strong, 30-foot-thick wall using over 800 tons of steel, 8,800 cubic yards of concrete and 1,000 embedded steel plates connected with beams and girders in order to provide structural support. 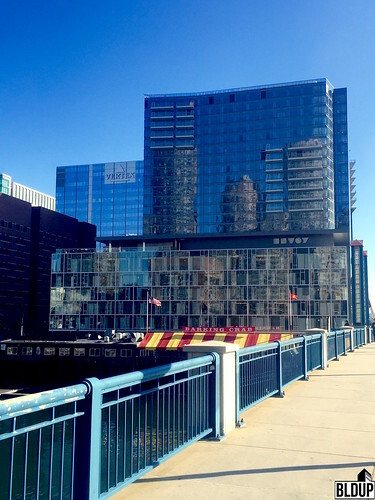 The Benjamin & VIA, two exclusive new mixed-use towers located in the heart of the Seaport District featuring 832 modern apartment residences and 250,000 square feet of retail, are now open. 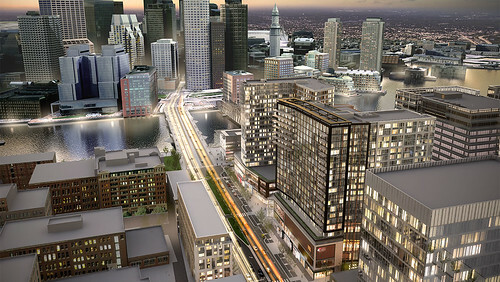 Spanning 1.5 million square feet, the $650 million development is Boston’s largest mixed-use project in over 30 years. 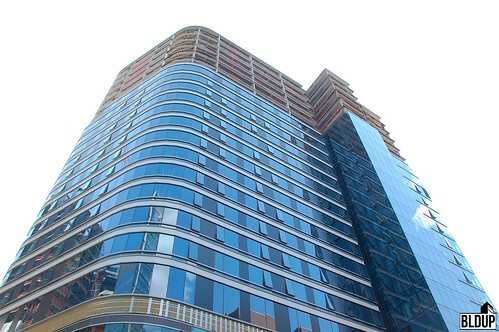 Luxury apartments ranging from studios to three-bedroom penthouses are now available for lease. 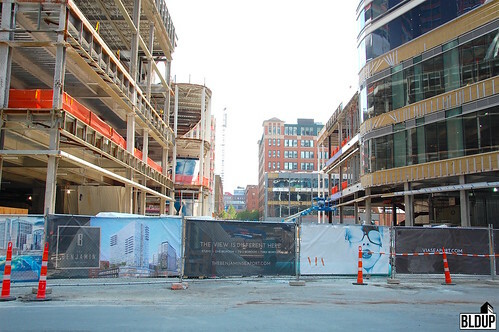 Retail at The Benjamin & VIA will open from late this Summer to early this Fall. Newly confirmed retailers include men's clothing store Bonobos, Italian coffee house Caffe Nero, outdoor outfitter Filson, clothing and outdoor gear store L.L. Bean, athletic apparel retailer Lululemon, men's clothing retailer Mr. Sid, and eyeglass retailer Warby Parker. Additional retailers will include fitness and lifestyle leader Equinox, Mexican tequila cantina rock bar Scorpion Bar & Restaurant and destination nightclub The Grand, bowling experience center Kings Bowl, chic restaurant and full bar Lobby Lounge, artisan Italian restaurant and marketplace Tuscan Italian Kitchen & Market, movie theater Showplace ICON Theatre and high-energy steakhouse STK®. 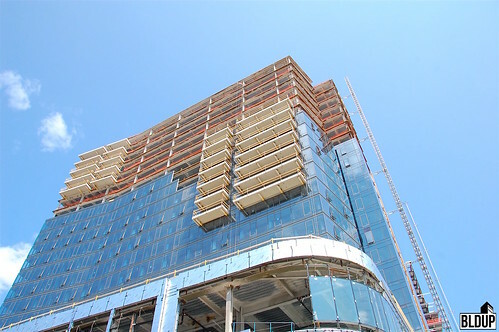 “We are thrilled to be part of such an incredible transformation taking place here in the Seaport, said Heather Boujoulian, Senior Vice President and Director of Development Investment Management at The Benjamin & VIA co-developer Berkshire Group, in a prepared statement. “From the exciting restaurants and retail stores to the recent opening of the church and the developing streetscape, our residents have access to everything right at their doorstep.” Newly revealed graphics of The Benjamin & VIA, in addition to the latest project information, are posted above. The Benjamin & VIA co-developer Berkshire Group has revealed new project details and renderings. Spanning 1.5 million square feet across three acres, The Benjamin & VIA is Boston’s largest mixed-use project in over 30 years. The latest project information can be found above. 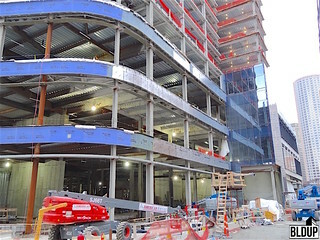 The One Seaport Square project is on schedule for mid-2017 completion. 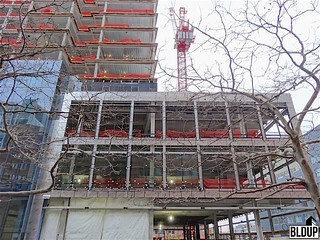 Updated photographs of One Seaport Square are posted above. More project information, including renderings, is posted below. 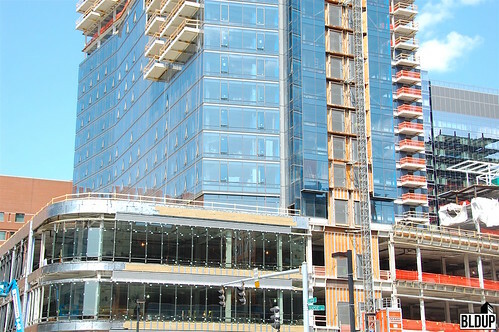 One Seaport Square's frame is well on its way to completion. 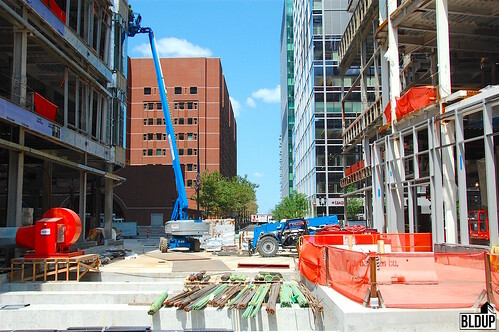 Per a recent update by John Hynes, Boston Global Investors' Managing Director, The Benjamin will top off within the next three weeks. 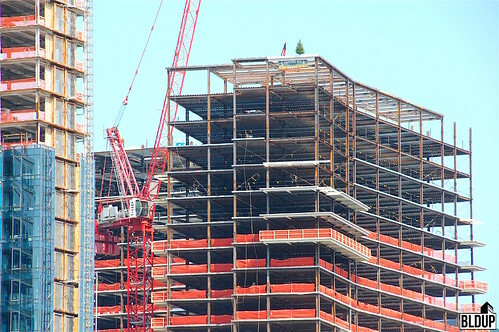 VIA will follow shortly afterwards, topping off within the next seven weeks. 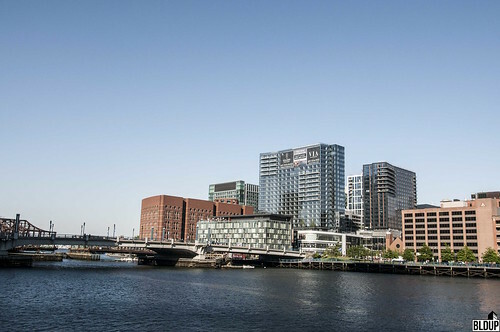 Berkshire Group shares details on the residences at The Benjamin and VIA, two mixed-use towers in the heart of the Seaport District. 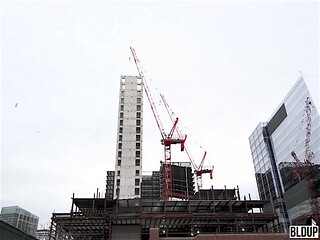 Situated on three acres of land and spanning 1.5 million square feet, the $600 million development is the largest mixed-use project in the City of Boston in over 30 years. 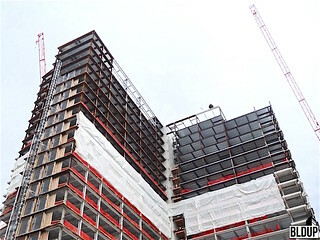 Upon completion, The Benjamin and VIA will encompass 832 modern apartment homes situated atop three floors of extraordinary shopping, dining and entertainment venues. 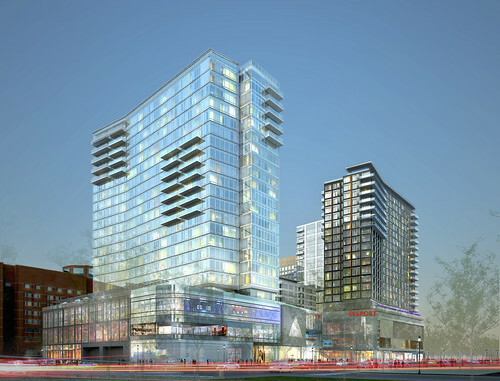 Berkshire Group has partnered with Boston Global Investors to own and develop the residences at The Benjamin and VIA. 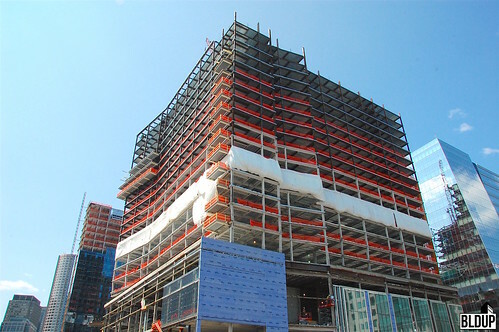 WS Development develops, owns, and manages the project’s retail component. 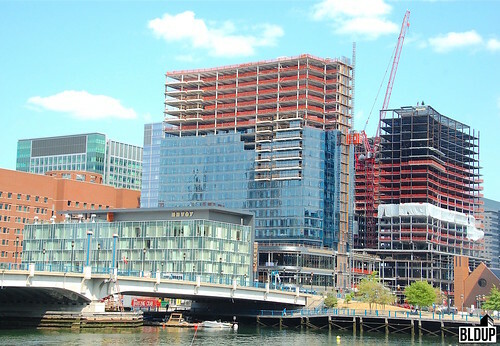 The Benjamin and VIA are arguably Boston’s most high profile developments and are cornerstones of the Seaport District, where over 20 blocks of world-class retail, office, and residential space are coming to life. 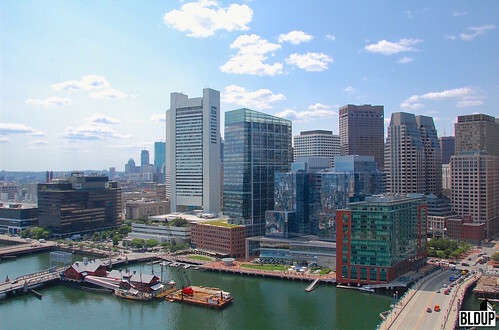 “The Seaport District is without a doubt ‘the new Boston.’ Since we broke ground in 2014, the neighborhood has become all the more desirable for its innovative residential, retail, and commercial space, not to mention its free urban programming in everything from fitness to tech. 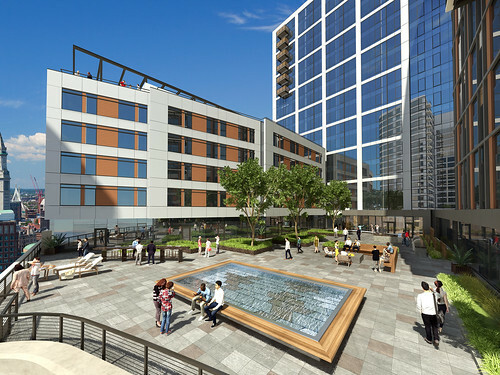 Upon opening in 2017, The Benjamin and VIA will create a residential experience that greatly enhances the excitement of this neighborhood and sets a new standard for the City of Boston,” says Heather Boujoulian, Senior Vice President and Director of Development Investment Management at Berkshire Group. Standing at 22 and 20 stories respectively, both The Benjamin and VIA were designed by the award-winning, Boston-based Elkus Manfredi Architects. 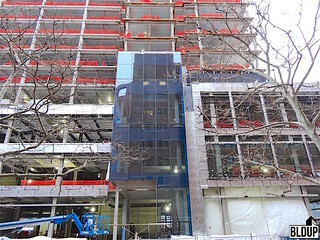 The towers boast modern glass architecture and are being built for LEED Silver Certification. Residences have plans to include over one acre of landscaped courtyards. 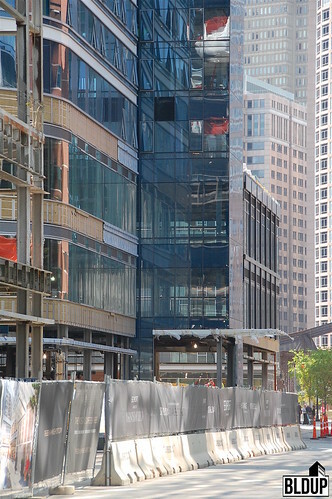 Nestled between the buildings is Courthouse Square, a 17,000 square foot open space that will serve as a key pedestrian link between Seaport Boulevard and Northern Avenue. 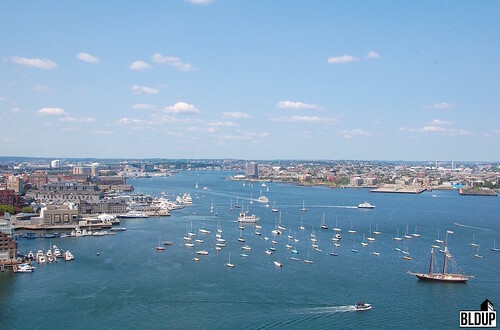 Residents of The Benjamin and VIA will enjoy an ultra-convenient location with direct access to downtown Boston as well as to the I-93 and I-90 interchange. Courthouse Station on the Silver Line is adjacent to the towers, while Logan Airport and South Station are in close proximity. The Rose F. Kennedy Greenway and Financial District are less than a quarter of a mile away. All apartments in The Benjamin and VIA are for lease only, allowing residents the freedom of flexible, mobile lifestyles. Each tower will have a distinct personality, providing a wide range of living options. Further details are below. 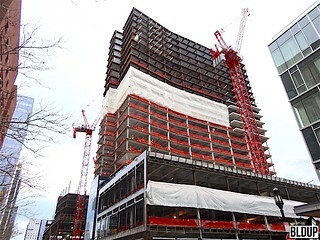 Standing at 22-stories, The Benjamin elevates luxury living in Boston by offering 354 distinctive apartments, 308 of which range from studios to penthouse suites. 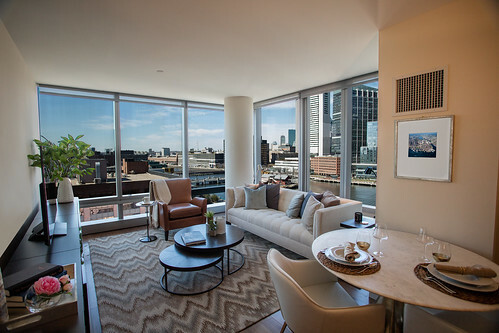 To create a socially expansive and diverse community, The Benjamin includes 46 units, ranging from studios to three-bedrooms, that meet the City of Boston’s standards for affordable rent. 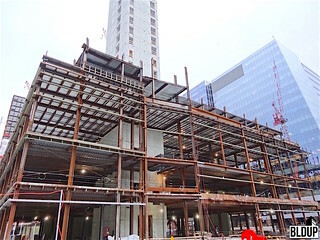 The first three floors of The Benjamin feature approximately 120,000 square feet of retail curated by WS Development. With plans to offer world-class shopping, dining, and recreation, retail in The Benjamin currently includes The Grand, Scorpion Bar & Restaurant, and Equinox. 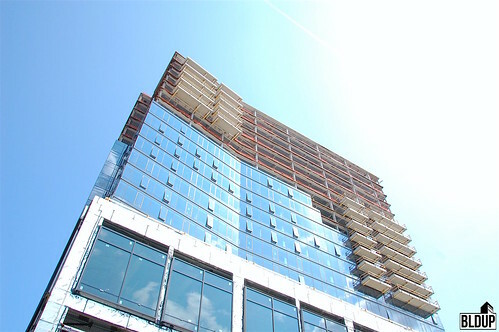 VIA is a trend-setting, high-energy building standing at 20 stories. It offers a unique mix of 478 modern apartment homes. 382 apartments are available as studios, one-bedrooms, two-bedrooms, and three-bedrooms; 50 of these units meet the City of Boston’s standards for affordable rent. 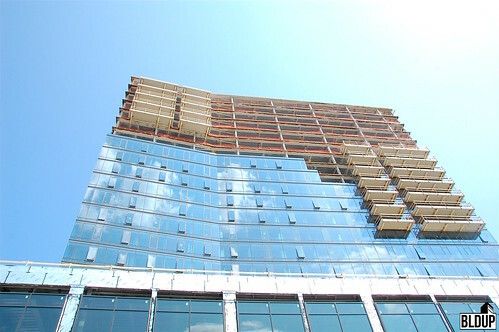 The Fusion Wing, devoted to chic, minimalist living, has 96 units with innovative studio and one-bedroom floor plans. The first three floors of VIA, curated by WS Development, offer approximately 130,000 square feet of retail space, and will showcase highly original shopping, dining, recreation and entertainment. Confirmed retail in VIA currently includes STK®, Kings Bowl, Showcase Icon Theater, and Tuscan Italian Kitchen and Market. · Equinox: Found within The Benjamin, this high performance fitness and lifestyle leader has developed a brand that represents service, value, quality, expertise, and innovation. Providing a holistic approach to fitness, Equinox offers an integrated selection of Equinox-branded programs, services and products, including strength and cardio training, group fitness classes, personal training, spa services, products, apparel, and food/juice bars. 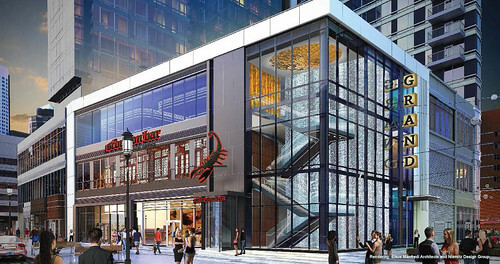 · The Grand and Scorpion Bar & Restaurant: Boston nightlife impresarios Big Night Entertainment Group (BNEG) will own and operate The Grand and Scorpion Bar & Restaurant, spanning 21,930 square feet within The Benjamin. Scorpion Bar & Restaurant will offer a traditional Mexican tequila cantina experience with the attitude of a rock bar. The Grand will be an 11,000 square foot space serving as both a destination nightclub and a 600-person private event space during the week. · ShowPlace ICON Theater: Owned by Kerasotes Showplace Theatres, ShowPlace ICON Theatre will be the newest location in the company’s 100+ year history. It will be located within VIA and will immerse guests in luxury with sophisticated décor, 10 auditoriums, and just 860 seats to provide an intimate cinema experience. All auditoriums will have cutting-edge technology for both sight and sound, wall-to-wall screens, and plush recliner seating for ultimate comfort. Seating will be reserved so moviegoers will never face the uncertainty of ticket availability or having just the right seat. There will be no ticket lines as guests will be able to download tickets on their smart devices via the Showplace ICON app. The theatre will also contain the Lobby Lounge, a chic restaurant with a full bar, seating for up to 175 guests, and dramatic views of downtown Boston. · Kings Bowl: Located within VIA, this locally grown Boston business rekindles the fun and escape of bowling with a memorable entertainment experience emphasizing homemade food, cold beer, creative cocktails, and great music. Kings Bowl will feature Private Bowling Rooms, Billiards, Shuffleboard, Air Hockey, and other fun and interactive games. Upscale, retro-inspired décor and executive-chef designed menus are brought to life by Kings’ “best-in-industry” service. With varied entertainment options, theme nights and state-of-the-art audio-visual equipment, Kings sets itself apart as an unparalleled social scene for all occasions. · STK®: STK is an immensely popular, high-energy steakhouse concept by The One Group. Opening within VIA, STK offers a modern twist on the American steakhouse with an infectious vibe, lounge, and live DJ. · Tuscan Italian Kitchen and Market: This classic New England brand will open a 320-seat artisan Italian restaurant and marketplace concept within VIA, serving made from scratch Italian cuisine, including thin-crust Neapolitan pizza. The 14,500-square-foot restaurant will also boast a marketplace that sells bread, cheese, gelato, and imported Italian goods. VIA is located at 5 Fan Pier Boulevard Boston, MA 02210. To connect with VIA, please visit www.viaseaport.com. About Berkshire Group: Berkshire Group is a real estate investment management company primarily known for its multifamily investment and operational experience. In addition to deploying capital through equity, debt and development in the multifamily arena, Berkshire invests in opportunistic ventures in other real estate sectors through its Venture Investments group. Over more than four decades, Berkshire’s team of industry leaders has gained a reputation for being able to identify opportunities and effectively manage through various economic environments, establishing a long-term track record of solid performance based on thoughtful, leading edge strategies, and operational experience. The Company has experience in disciplines including acquisitions, portfolio and property management, debt, development and redevelopment. Berkshire, a registered investment advisor, is headquartered in Boston and has offices in Atlanta, New York, Baltimore, Dallas, Houston and San Francisco. As of June 30, 2016, Berkshire Group had approximately $7.2 billion in real estate assets under management. For more information on Berkshire, please visit www.berkshire-group.com. 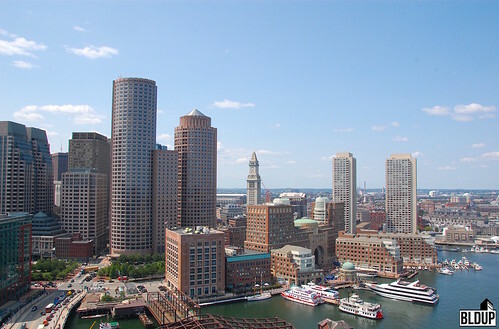 About Boston Global Investors (BGI): Boston Global Investors (BGI) is a leading real estate development and consulting firm headquartered in Boston. 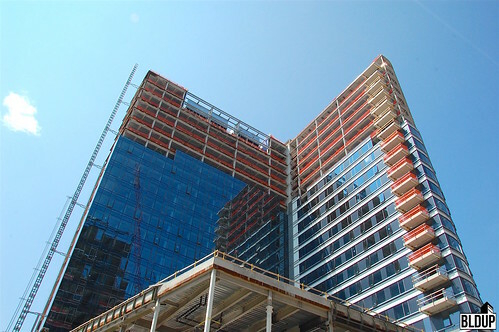 Led by John B. Hynes III and a team of experienced real estate professionals, BGI has over 30 years of experience developing commercial, residential and mixed-use projects from landmark towers to city-scale development. 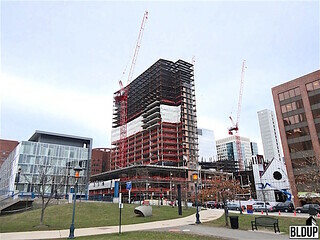 Current projects include The Benjamin & VIA in Boston’s Seaport, and the redevelopment of United Technology Corporation’s 47-acre Rocketdyne facility within LA Warner Center in Los Angeles, California. BGI was also a major shareholder and co-founder along with Gale International in the New Songdo City project in South Korea---a massive $35 billion, 100 million square foot master planned city. 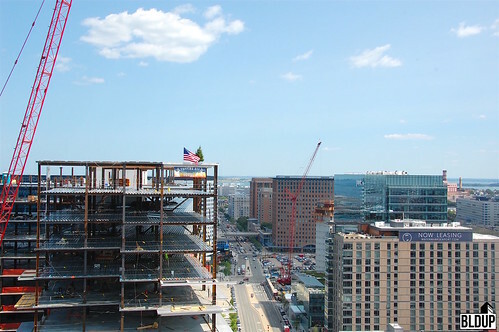 Prior to forming BGI, Mr. Hynes developed the 1.1 million square foot State Street Financial Center tower, the 500,000 square foot 101 Arch Street tower in Boston, MA, and the 500,000 SF MITC Center in Chelsea, MA. About WS Development: WS Development is a Massachusetts-based property developer dedicated to the creation of places where people want to be. 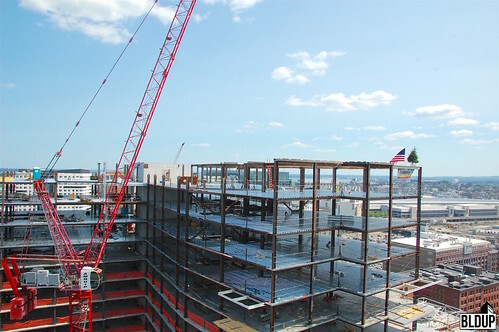 With more than 20 million square feet of existing space and an additional four million under development, it is one of the largest privately-owned development firms in the country. In business since 1990, WS is a vertically-integrated company that develops, owns, operates, and leases over 90 properties, including urban buildings, lifestyle centers, power centers, community centers, and mixed-use developments. Its goal is to be a contributing member of each community it serves. WS takes pride in its commitment to its roots, reflected by its properties in and around New England, but also finds great satisfaction in immersing itself in new locales and expanding its national portfolio. 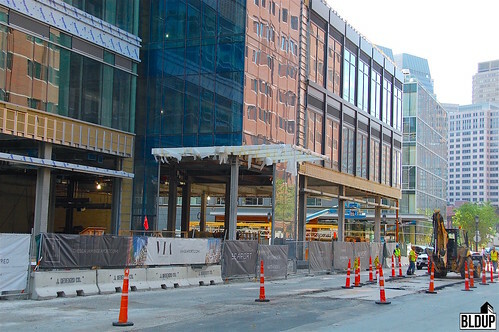 For more information, visit www.wsdevelopment.com, call 617.232.8900 or follow WSDevelopment on Facebook, Twitter and LinkedIn.